The PSDIN-41000R Series range of power supplies are designed for quick and trouble-free installation onto 35 mm profile DIN rails. With outputs ranging from 5 to 24V and maximum current capabilities from 100 to 500 mA, these units are ideal for most instrumentation and control systems. 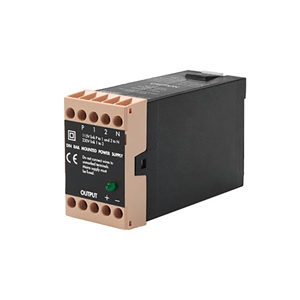 Every model in the range is provided with output current foldback limiting and is fully shortcircuit protected. Great attention has been taken to usability and safety. The double insulated housing protects users without the need for earthing. A green “supply on” LED is provided to clearly indicate the presence of power, and link selection allows the use of 110 or 230V supplies without derating. The PSDIN-42000B Series DIN rail mounting power supplies are supplied ready for connection. The unit has only to be snapped on to the 35 mm profile rail and connected to the clearly marked terminal screws. A status LED indicates power is on. For increased power two or more units may be connected in parallel. The output of these units is fully protected against short circuits and overload.